If you read my blog post from yesterday, then you already know about my intense accountability for the next 15 days. On top of sticking to my weekly dinner and exercise plans (see awesome steak salad from last night's dinner below), I have started keeping track of every single thing that goes into my mouth. Tracking nutrition is something I do most of the time, but not all of the time. That's going to change during these next 15 days! Why 15 days? Well, I am leaving for my cruise on February 7th and I want to lose about 7 lbs. before then. These next 15 days, I am also going to update you with the total number of calories I am eating and working off through exercise per day. I am going to share exactly what I ate, and exactly what I did for my workout each day. Numbers 1-4 have been in effect since the new year as my January Challenge. Numbers 5-7 are my new goals. Day number one of tracking nutrition, keeping track of my calories in and out, as well as keeping track of everything consumed, went well. My workout was really fun last night! Reason being: a certain friend of mine joined me. Readers, meet Karlie. We have been friends since high school! She's one of my closest friends, and I'm so glad we have opportunities like this to get together. 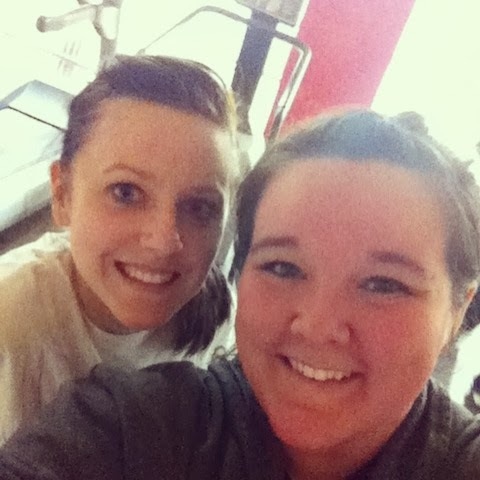 It was SO great to have a friend on the treadmill beside me. We went to the high school gym, where it's free to use their equipment. Once we made plans to meet last night, I was locked in to working out. It's so much easier to bail on yourself, but there was no way I was going to bail on my friend! Gym buddies are the best for accountability. And, let's face it, hanging out with friends is a total mood booster. Combine that with the mood boost you get from exercise and it was a super great night! GO get it Kay! :) I know you can lose the weight before the cruise.